May is almost here and in Cincinnati that means that it is time for Pigs to Fly. Along with Cincinnati style chili and being the birthplace of professional baseball, Cincinnati is known for pigs. For a time in the first part of the 1800’s, Cincinnati’s easy access to river transport and farmland helped propel the city to being the number one pork processing center in the country. In fact Cincinnati was once known as “Porkopolis” and it was said that Cincinnati was where pigs fly. There are a number of theories about the origin of this saying, one popular story is that when the hogs were being delivered from the Kentucky side of the Ohio River to the slaughter-house on the Cincinnati side, they were loaded on flat top barges. The early morning fog on the river would cover the barges as they glided across the water. This left the naked eye to see “flocks” of pigs “floating” above the water giving the appearance that the were “flying” to Cincinnati. To this day, you can find a lot of “flying pig” items at the airport and in many shops around Cincinnati. The “flying pigs” really take flight the first Sunday in May with the occurrence of the Cincinnati Flying Pig Marathon. 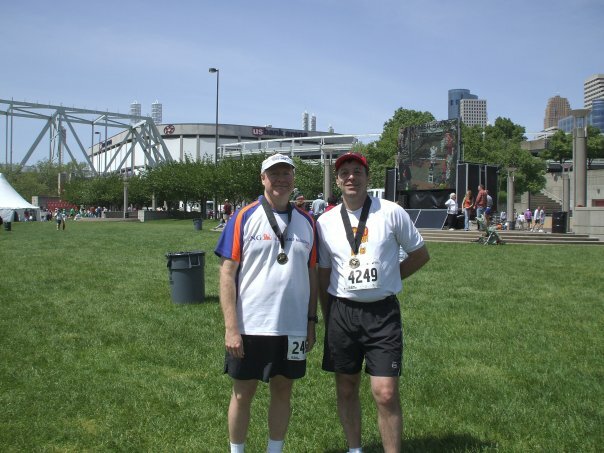 I do not claim to be a “runner,” but I have participated in the Flying Pig Marathon. I blame my running on my dog, but that is another blog for another day. My marathon “career” started one day in September of 2002 when Connie, a friend, co-worker, and marathoner stopped by my cubicle and informed me that she was going to run the Columbus Marathon and that I should run it as well. My first question was, “When is it?” She replied, “Three weeks.” I told her there was no way, I had never run more than 10 miles in my life. She told me that if I could run ten miles, I could finish a marathon. “It is just a 10K with a 20 mile warm up,” she said. Connie told me that you get excited running in such a large group, there are pople cheering you on, and you have to get back to where your car is. So, I went home, ran 12 miles that night and then signed up for the Columbus Marathon which I managed to complete. I found the marathon to be a lot of fun, in a strange and somewhat painful fashion. 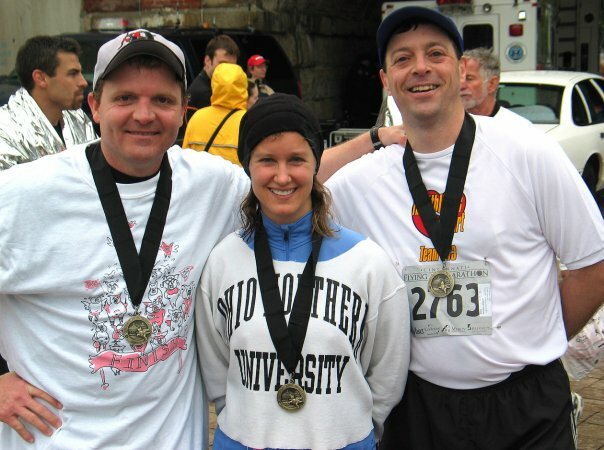 When we got back to work, I asked Connie, “When can we do another?” So I signed up for the Flying Pig in May of 2003 and every year since, until this year. We talked Dave, another co-worker into joining the fun a few times as well. Connie and I have started ten Flying Pigs together, a few we even arrived at the starting line before the gun sounded. Twice, Ryland, my Stetson roommate flew up from Florida to fly with the pigs. However, I am a little sad that this year, my Flying Pig streak comes to an end. As much as I have enjoyed being apart of this marathon, I am excited that this Sunday, we will be attending the graduation of our youngest son at The Ohio State University. You know, raising three sons is a marathon in its own right except there is no medal at the finish line. (Actually there is no finish line). 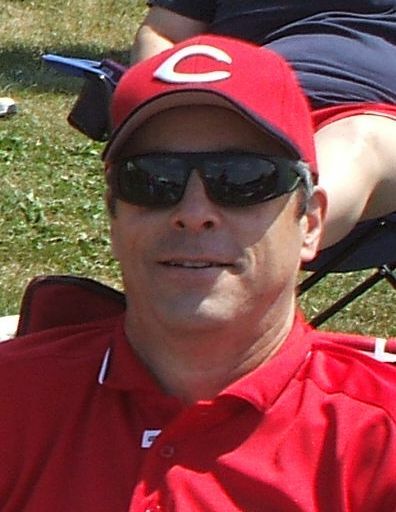 This Sunday, the pigs will once again fly in Cincinnati while I will be penned up in Columbus, but maybe next year, once again, this little piggy will be going wee, wee, wee all the way to the Finish Swine. This entry was posted in Humor on April 28, 2014 by Leonard. Sometimes I wonder what happened to the future. I always thought that I was born on the edge of the future. 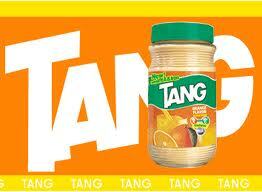 The same year that I was born General Foods began marketing Tang, the orange-flavored powdered drink mix. John Glenn took Tang into space with him and you could drink the very same stuff at home while you dreamed of going into space. All you had to do was take two tablespoons of this magic powder and add it to eight ounces of water, stir vigorously and you had a drink with 100% of your vitamin C, 100% of your vitamin A, 100% of your vitamin E, 100% of your calcium, 100% of your riboflavin, and 100% of your niacin for the day and no real oranges were harmed in the process. The future looked bright, innovation was the key. In the future science would meet all our needs, nutrition-wise and other-wise. Man continued to go into space and the trips became longer. It was obvious that man could not live on Tang alone. So, as the space program grew so did the culinary possibilities. In the late 1960’s Pillsbury joined in with the creation of Space Food Sticks, a “non-frozen balance energy snack in rod form containing nutritionally balanced amounts of carbohydrate, fat and protein.” “Nutritionally balanced” was one of those great sounding marketing phrases which no one can explain like “ph balanced.” Space Food Sticks came in six flavors including peanut butter, caramel, and chocolate. A man could live in space or on the earth if he had Tang and Space Food Sticks. After a few quiet decades on the “food of the future” front, 1987 brought us Dippin’ Dots, the “Ice Cream of the Future.” This ice cream gravel is created by flash freezing ice cream mix in liquid nitrogen – it is like cryogenics for food, that is pretty futuristic I guess. (Although I have often wondered what exactly one is supposed dip Dippin’ Dots in and it seems like it would be difficult to dip something so small in the first place.) No one is quite certain how many other foods were flash frozen before they hit on a winner with ice cream. Now almost thirty years has passed and apparently, the future has not yet arrived and Dippin’ Dots remains the “Ice Cream of the Future.” I have a feeling that when the future does arrive, I may be disappointed with what it brings. This entry was posted in Humor on April 21, 2014 by Leonard. Friday Funny April 18, 2014 – Hop To It!! Happy Friday! What a week! One day I wake up to the ground covered with snow and the next afternoon I am cutting the grass!! But I do think that spring has finally arrived. Just in time for Easter, here is a basket full of rabbit jokes. Wishing you a happy and joyous Easter and Passover. Q: What is a bunny’s motto? A: Don’t be mad, be hoppy! Q: What is a rabbit’s favorite dance style? Q: Where do rabbits go after their wedding? Q: What do you get if you cross a rabbit with an insect? Q: What do you call a group of rabbits hopping backwards? Q: What do you call a rabbit who is angry over getting burnt? Q: How can you tell which rabbits are getting old? A: Look for the grey hares. Q: Why are rabbits so lucky? A: They have four rabbit’s feet. Q: How do bunnies keep their fur neat? A: They use a harebrush! Q: Why did the bunnies go on strike? A: They wanted a raise in celery! Q: Why did the bunny get so mad? Q: What is white and has long ears, whiskers, and sixteen wheels? A: Two rabbits on Rollerblades! Q: What is a rabbit’s favorite restaurant? This entry was posted in Friday Funny on April 17, 2014 by Leonard. In our ever-changing, nothing is permanent, instant gratification, throwaway world it is easy to lose sight of where we have come from, to forget our roots. My family tree has deep roots in the Bluegrass State of Kentucky. I have been told that my forefathers settled in Estill County in the late 1700’s and I still have relatives there today. My father was raised on a farm there and still thinks of the hills that are the western edge of the Appalachian Mountains as home. There is even a spot on the map with the name of Wagersville — it really is not much more than a spot on the map. For many generations Wagers were born, raised, lived, died, and were buried in Estill County. There is a cemetery close to Wagersville where several generations of Wagers lay in rest in the shadow of the hills. I remember going to the Wagers reunions growing up which were held in even-numbered years. Family that had been scattered throughout the land would come back to the hills and hollers to catch up on what everyone was doing. Often the reunion would take place at the Indian Fort Theatre in Berea. 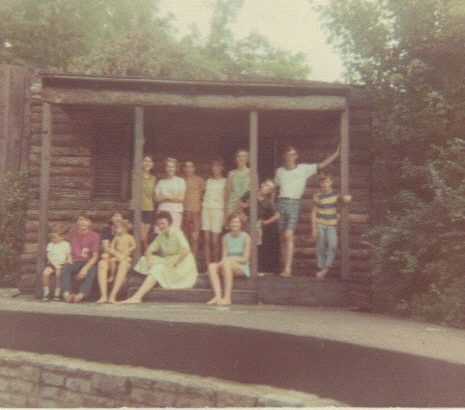 There was a stage there and on one side there was a cabin-front that was used for productions as seen in the picture above. (Yes I am in the picture.) I chose this picture because I think it captures something I have some to realize and appreciate: being a Wagers means having a sense of humor. As far back as I can remember I have been trying to tell jokes and trying to be funny (notice I did say “trying”). I can remember jokes that were told to me by Aunts and Uncles and cousins. Several years ago I remember that my Great Aunt Helen’s 90th birthday was celebrated as part of the reunion. At one point I walked into the kitchen and there was Great Aunt Helen sitting at the table and enthusiastically telling jokes. It hit me right there — it is not my fault that I keep telling jokes and finding the humor in situations, it is in my genes. So don’t blame me that I post, supposedly, humorous blogs or that I will tell you a joke when I run into you, it is a genetic condition (I wonder if it is covered under ADA?) Perhaps you think I am just plain nuts. Well, it appears that this nut indeed has not fallen far from the tree. This entry was posted in Humor on April 14, 2014 by Leonard. Happy Friday! I hope you have had a good week up to this point. However, as a CPA, it is my duty to remind you that April 15 is almost here. This week my goal is to ease your pain just a tad. So, I have dug deep into the Internet to find some tax related quotations for you. I am thankful for the taxes I pay because it means that I’m employed. This entry was posted in Friday Funny, Humor on April 10, 2014 by Leonard. 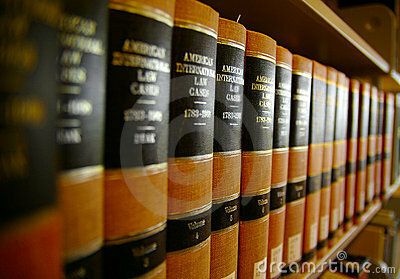 Each day we have to navigate our way through a veritable sea of laws. There are federal laws, state laws, county laws, municipal laws. There are a ton of laws out there, literally. In 1970, the Code of Federal Regulations alone was 54,834 pages and by 1998 this had grown to 134,723 pages. I hate to think what the number of pages is today. On the federal level there is a United States federal law makes it illegal to issue a fake Weather Bureau forecast, Some days I wonder if you could tell the difference? In Ohio, it is illegal to fish for whales on Sunday. But in Tennessee, the only game you may shoot from a moving automobile are whales. In Oklahoma it Is Illegal to have a sleeping donkey in your bathtub after 7 pm. If you go to Chicago for a nice meal and the restaurant catches on fire, leave immediately, because the law forbids eating in a place that is on fire. If the law books have room for all these frivolous laws, surely there is place for a law which I am certain you will agree with me and see the value of. I am seriously considering writing my congressman and ask him to introduce the Uniform Coffee Maker, Microwave and Copier Act. Think about it – how many times have you purchased one of these products, stayed in a hotel room or gone into an unfamiliar office and tried to use one of these devices – you just stand there with that proverbial “deer in the headlights” look just waiting, hoping, praying for someone to come along and tell you where the on switch, brew switch, popcorn or copy button are. I know we have our share of problems, but this is still a great country. I am convinced that if we brought together some of the greatest minds, they could develop a universal instrument panel for each of these devices. A real stroke of genius would be if they could develop one standard cluster that could be used on each one. I even have a little motivational trick to assist the process. We put all these brilliant minds in one room with a coffee maker, a microwave and a copy machine and then each day we put in a different brand or model. After a few days there would be total buy-in. Don’t you think it is about time that we got Congress doing something productive? You can thank me later. This entry was posted in Humor on April 7, 2014 by Leonard.